“The kids were so naughty last year!” was the biggest difference teachers, Ncobile and Michelle made when comparing the 2007 students to the 2008 group. While they’re inclined to blame a couple of mischievous individuals for leading the others astray last year, it seems there’s also other factors at play. “I think its both because we have more experience teaching, but also because we have been able to improve the infrastructure,” said Michelle, now ex-MPS teacher. Ncobile noted that having more teaching resources, play equipment and better desks and chairs made planning the activities and managing the kids a lot easier. But classroom behaviour is not the only thing that’s changed this year. 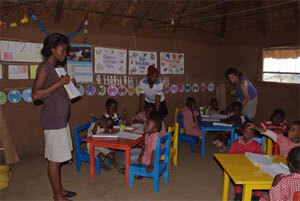 We have a few kids who have joined us for the second year, as they are still too young to go to primary school. It’s wonderful to have them back, but it’s kind of strange. Last year they were the little, shy ones, who needed help taking their pants off and blowing their noses. This year they’re trying to lead the new kids astray, showing them what to do in class and helping them get their clothes on and off. The before and after school hangout spot has also changed this year. Most kids wait a couple of hours after school so they can return home with their older siblings, so they need something to do. While last year’s group favoured spending their afternoons hanging out with Make (Mrs) Gamedze at the shop, this year the kids’ favourite spot is the kitchen of Matjana Primary School. It seems they go there for a second lunch! It is a really kind gesture of the primary school, as their feeding program is stretched and our kids certainly aren’t suffering from the extra meal. Where the kids go has changed, but what they do remains essentially the same. They continue to wander around in little gangs, proudly showing off what ever they made, coloured or learnt at school to anyone who’ll look or listen (much to the amusement of the older primary school kids). It seems there’s no end to the amusement they can derive from singing the ABC song, or saying, “My name is so and so, I am five years old, I go to Matjana Preschool, I live in Kaphunga area.” So we continue to be impressed with the kid’s enthusiasm! There has been some personnel and responsibility changes in 2008. There is a new school committee (see last newsletter) and the parents are now looking after the school’s water, buildings and grounds (the grounds are also the premises of Woza Nawe Tours who are now contributing E50 per month to the school because the parents are maintaining the grounds). Two parents come to the school every fortnight and give the classroom a thorough clean, cut the grass, tidy the yard and fetch water from the spring – it is about 500m away and the teachers are really glad to be free of this responsibility! It’s also great that the parents are so committed to helping keep the school running smoothly. There have been changes to the teaching staff as well. Michelle is no longer teaching at the school. While everyone (including Michelle) is a bit sad that she has gone, we are pleased she is still nearby and will continue helping with the school fundraising. We are also pleased to welcome Fortunate Sihlongonyane, who will be teaching in the classroom with Ncobile from now on. Fortunate is a 19 year old woman who has lived in Kaphunga with her parents all her life. She completed high school in 2006 and has also worked at one of the local shops. She’s happy to have a job which will help her develop new skills and loves working with the kids. We are also extra happy that Ncobile is back in 2008. Some things change, some remain the same. Most importantly Matjana Preschool continues to educate kids in Kaphunga– that’s something we hope will remain the same for a long time!